In 2009, a couple of weeks after the end of Israel’s massacres in Gaza, dubbed "Operation: Cast Lead", I decided to adopt the Palestinian call for boycotts, divestment and sanctions (BDS) against the state of Israel. The three-week assault, which served as the model for last summer's rampage, was carried out on the pretext of ending erratic rocket fire from the besieged Gaza strip. In reality it represented an escalation of the daily violence committed by Israeli occupation forces against a relatively defenceless civilian population, themselves mostly refugees from previous rounds of aggression. Fourteen hundred Palestinians were killed, mostly civilians, including at least 308 children. Thousands of innocent people were injured, disabled for life, or orphaned, traumatised and made homeless. The carnage comprised of various war crimes, including the use of white phosphorous, the mass killings of near-entire families, the shooting of women and children waving white flags and the destruction of schools and pre-schools. Israel, whose military spokespeople claimed self-defence, lost ten soldiers and three civilians to home-made rockets and friendly fire. "We support the Palestinian struggle for freedom, justice and equality. In response to the call from Palestinian artists and cultural workers for a cultural boycott of Israel, we pledge to accept neither professional invitations to Israel, nor funding, from any institutions linked to its government until it complies with international law and universal principles of human rights." The Artists for Palestine UK website goes on: "APUK recognises that Israel has, since 1948, denied fundamental human rights to the Palestinian people; that dispossession, colonisation, land annexation, illegal settlement and military aggression are habitually deployed by the Israeli state without it facing sanction, or any threat of sanction, from Western governments. "Israel deliberately undermines Palestinian cultural expression while marketing its own cultural output worldwide, thus attempting to cast a veil over its violations of human rights and international law. 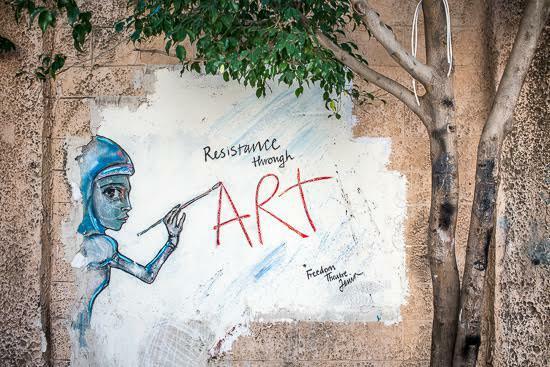 We think that Israel’s campaign to exploit culture as a diplomatic weapon, the ‘Brand Israel’ strategy, requires an urgent response from artists of conscience." Given that Palestinian rights have been systematically denied in a seven-decade-long campaign of dispossession, we must consider why that "urgent response" should take the form of a boycott. Part of the answer lies in history. Non-violent resistance movements have employed the tactic successfully, perhaps most famously against the segregated buses of Montgomery in 1950’s America as part of the broader civil rights movement (buses that found their successors in the West Bank), and more recently against apartheid South Africa, forming a key part of the struggle that eventually led to Nelson Mandela’s long walk to freedom. The comparisons are more revealing than might first appear. All three systems – US segregation, South African apartheid and Israeli hafrada (the Hebrew for Israel's particular version of imposed "separateness") – codify racial discrimination. Israeli lawmakers merely updated and made more sophisticated the previous incarnations. When white supremacists in South Africa needed a good word for their brand of legalised racism, they realised ‘segregation’ was accurate but already too emotive - not to mention taken - and so settled on ‘apartheid’ (literally: apart-hood). Anti-apartheid leader Archbishop Desmond Tutu is among many South Africans who have consistently made the comparison with Israel’s system of institutionalised oppression. Paradoxically, opponents of BDS frequently claim that any boycott of Israel - no matter its basis in international law - is inherently motivated by anti-Semitic prejudice. This claim is as baseless as it is dangerous. Guidelines relating to the academic and cultural boycotts are unequivocal in their opposition to any form of bigotry, positions headlined by the Palestinian Campaign for the Academic and Cultural Boycott of Israel (PACBI) and others. The movement, an attempt to end racist, systemic discrimination, does not target individuals according to their nationality or beliefs, and as such is incompatible with any form of racism, including anti-Semitism and Islamophobia. When Zionists falsely equate this nonviolent resistance movement with anti-Semitism, it can only serve to undermine sincere efforts to challenge racism of all kinds, in Israel and elsewhere. While some British musicians have been vocal in their rejection of the boycott, perhaps most notably Ride’s Mark Gardener, many have refused to play in Israel, including those who cancelled shows that were already booked. In one example, Klaxons were amongst several groups who pulled Tel Aviv performances in 2010, in the wake of Israel's killing of ten unarmed civilians on the Gaza aid flotilla, the Mavi Marmara. Jamie Reynolds told me soon after: "I'm certain that we made the right decision regardless of the barrage of hate mail." "Since it was founded in 2005 I have honored the Palestinian BDS call by not accepting offers to perform in Israel, though all the while having the inherent belief in the importance of bringing music, art, education (love) to friends. With cursory knowledge of the boycott's principles and not exactly concurring with the aspects of requesting certain limitations on cultural exchange I reconsidered and accepted a kind offer from promoters in Tel Aviv (as announced for April 2015). "It was with serious deliberation that I eventually arrived at the personal conclusion that to perform with my band in Israel was in direct conflict to my values. With the realization that a cultural and academic boycott is central to its purpose in exposing a reality of brutal human rights violations – including those accompanying Israel's discriminatory laws and occupation of the West Bank - I felt the need, with humility, to cancel the engagement. "Subsequently the choice to play in Tel Aviv, while a boycott based on principles of non-violence exists, initiated for me an active study and contemplation in which emerged an enlightenment of personal judgment. This is in admiration to the fans, friends and neighbors who have engaged me in discussing the complicity of crossing this very real line of protest. "With apology and thanks to everyone I work with professionally, as this decision incurs difficult rectification, and to every individual with a wish to hear us play live, I've made the decision, with certitude, to fully acknowledge the dedication of the boycott until the time comes for it to be unnecessary." He added: "When Sonic Youth played Tel Aviv in 1996 it was an amazing, wonderful experience and education. I hope to return soon." By contrast to these acts of resistance, last summer, at the height of Israel’s brutal seven-week military campaign, our very own David Cameron reaffirmed his "staunch support" for Israeli Prime Minister Benjamin Netanyahu’s assault, as the US quite literally replenished his munitions. The relationship between Western powers and Israel is one of extensive collusion too detailed to go into here; it's enough to point out the USA's more than $100 billion in aid to Israel and the UK's central role in its establishment. The abject failure of powerful governments to challenge Israeli apartheid, siege and occupation, means it falls on the shoulders of ordinary people to organise against oppression. "Who in their right mind would have performed in South Africa during the Apartheid era? However you wish to term what is happening to Palestinians at the hands of the Israeli state, or whether you agree or disagree with the parallels between apartheid South Africa and Israel's occupation of Palestine, you can't deny the abject suffering of the Palestinian people, and the obscene iniquity between the quality of lives of Palestinians and Israelis. We have to do anything we can to change it." Palestinians face overwhelming challenges, particularly in the form of an extremist, right-wing Israeli government committed to entrenching ethnocracy, one prepared to employ extreme violence in its efforts, but they are challenges which must be overcome in order to achieve self-determination. Yet the counter-argument is often made that Israel should be regarded as a force for democratic values in the region, if not as "the only democracy in the Middle East", and treated accordingly, rather than subjected to boycotts and labelled with pariah status. This has been a useful diversion. Israel could only be founded as a Jewish-majority state through a programme of ethnic cleansing, a concerted campaign of usurpation involving massacres, intimidation, and wholesale theft of land, property, bank accounts, art and literature, which caused the flight of the majority of the native Palestinian population in what is known across the Arabic-speaking world as the Nakba, or catastrophe. Israelis see the establishment of their settler-colonial state as the "war of independence" and deny the historical fact of the Nakba at every possible official, legal and cultural level. That a parliamentary system of democracy now exists within a state that expelled its indigenous inhabitants for not being Jewish, and which still upholds that system through racist laws that prohibit those refugees from returning to their own homes, does not a democracy make. Israeli lawmakers and commentators flit between obsessing over the ‘demographic threat’ posed by Palestinian babies – one well known scholar and government advisor Arnon Soffer is nicknamed "the Arab-counter" - and openly calling for genocide. Given the incessant violence and ongoing dispossession, Palestinians see the Nakba as continuing to this day. "This day turned out to be the most 'terrible' day of my life... I mean 'terrible' in its proper meaning: appalling, shocking, emotionally unbearable. "The bus we travelled in was stopped so many times, soldiers barking at us; in a street, all windows were shut and welded blind with sheets of metal. "Everywhere was hatred, hostility, violence, aggression from the Israeli settlers. Everywhere was despair, fright, helplessness in the eyes of the Palestinians. "I managed to slip away from our group and get into a district where obviously no-one was supposed to enter. I walked deserted streets but felt heavily observed, so I sat down on a house porch and waited. Soon a young boy appeared. I asked him for coffee. After a few hesitations and me stupidly repeating with a smile "kawa, choukran?" (coffee, thank you? ), the little one decided I must be nuts but harmless and took me to his parents house. I cannot express well what I felt but it was extremely moving: they had not much to offer, but it was given with warmth, grace, honourably. "They told me in broken English and broken French how life was on their side: No work, no school, no stores, no freedom of movement. "The Israeli regime is an apartheid regime. It has constructed a huge wall and checkpoints in the West Bank to segregate Palestinians from the Israeli settlers who have stolen their land, and it holds Gaza under siege to prevent Palestinians from leaving and to prevent food, medicines and construction materials from entering." "The Palestinian people have called on the world to boycott Israel, including a cultural boycott, until it ends its occupation of their land and the oppression of their people. As people of conscience, who stand against racism and apartheid, the only moral response we can have to that call is to heed it."